:: The primary buying option is through eCommerce. Please click an icon below from the formats available and you will be taken to the secure purchase point. For further help with formats click 'here'. aai Scotdisc are proud to present the worlds first DVD-Video featuring Pipes and Drums. Follow The Royal Scots Dragoon Guards on an inspirational journey through some of Scotland's premier locations. Led by Pipe Maj Bryon Brotherton and Drum Maj Stuart Orr. 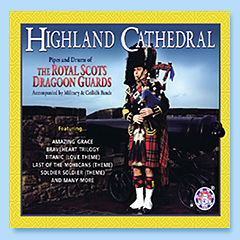 Accompanied by Military and Ceilidh Bands, scenes include Edinburgh Castle, Dunblane Cathedral and The Palace of Holyroodhouse. High quality video and audio combine with interactive menus on the DVD creating a high level of presentation. Bonus features include individual scene selection, a gallery slideshow and SCOTS DG biography. This is a ground breaking product for Scottish msuic and video. Please note that the video presentation of this product may contain a modified tracklist to the music CD and Cassette. DVD and Video Visits on this presentation include:- Edinburgh Castle, Stirling Castle, The Palace of Holyroodhouse, Dunblane Cathedral and many more. Videos and DVD's are normally available in PAL and NTSC Format. Please note with your order which format you require.